Mickey Price is a pre-teen orphan in 1977. He’s smart and inventive. Trace Daniels is a twelve-year-old girl go-cart champion. Jonah Jones, also twelve, is a brilliant scientist. The three of them are invited to NASA in the summer (where they meet for the first time). At first, Mickey expects the time to be a typical summer camp-type experience, but it quickly becomes obvious that they are training just like the adult astronauts. NASA, it seems, has a secret space program, and already has a base on the moon where they are mining a precious metal. But something has gone wrong and all the adult astronauts are getting sick from the material and had to vacate the base. But there’s a serious risk that a nuclear reactor that’s been built on the moon could explode since there is no one there to turn it off. Since the adults can’t go there without getting sick, NASA has decided to send their brilliant, well-trained kids to the moon to finish off this important mission. Author John P. Stanley does a really great job of capturing a youngster’s imagination and fulfilling a fantasy. Anyone who’s ever been interested in the space race or observing the moon and the stars would probably have had fantasies of being called upon to go into space and be a hero. I know that I did at that age. The book is for younger readers, probably about age twelve and under, and there’s enough adventure and enough twelve-year-old socializing to really keep kids interested. I’m not sure why the book is set in 1977. Most children today won’t have a concept of that era and the book doesn’t really go in to explain that period very much. Since NASA hasn’t had a moon program since 1972, it would have been just as easy to set the book in the modern-day – and possibly even more believable that there would be a secret base on the moon. There are a few pieces of science that don’t quite work – especially if this is set in 1977 – but since this is a work of fiction and intended to appeal to a younger audience we can forgive much of it. Looking for a good book? 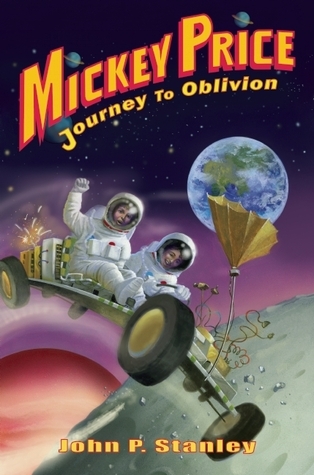 Mickey Price: Journey to Oblivion, by John P. Stanley, is a fun, adventure-filled space-opera fantasy for pre-teens.